One of the annoying things in Australia is that we still value wineries considerably more than Vineyards. To see evidence of this you only need to look at how winemakers are treated like rockstars – even when they don’t have any vineyards – while viticulturists are seen as simple farmers. It’s an odd situation that largely ignores terroir (and is still slow to change). I had that in mind after trying this superb Riesling, which comes from a close-planted vineyard I’ve never heard of and in a location not known for Riesling. A site that likely deserves more attention, but historically would have been blended away into a wine simply labelled as ‘Victoria’. Rory Lane calls this wine a ‘regional departure’ as his previously source for Riesling, the Barratt Vineyard in Henty, is no more. On the hunt for cool-clime fruit, he got word of a vineyard next door to Brown Brother’s Whitlands site with some handy Riesling. That led to the Croucher Vineyard – a close-planted block planted on volcanic soils in the mid-1980s at 800m above sea level. Of interest is the numbers here – pH 2.90 (mad low pH), TA 7.6g/L (shedloads of acidity) and RS 8g/ltr (a dash of sweetness). That residual sugar may seem token, but it is enough to make this bone dry, grapefruity white rather well-balanced. It’s a grippy wine too, yet retains the delicacy of a cool climate Riesling, lifted up by a faint whiff of sherbet. Delicious. Normally I’d expect a shutdown for an Australian Riesling at the 2yr mark, but this is in wonderful form, the sugar/acid/flavour balance uncommon in domestic Rizza, and just a step behind the best Germanic wines in depth and glory. Ripper wine. Best drinking: 2017-2040. 18/20, 93/100. 11.8%, $29. Would I buy it? Sure would. Well priced and delicious. Could you please explain in a little more detail the how and why? 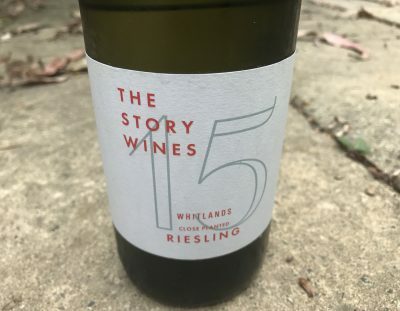 Typically most Australian Riesling shows it’s primary fruit for a good 12-18 months after bottling, before a flat, intermediate spot when the flavour of fruit recedes, then the secondary bottle development kicks in and the flavours pick back up at the 4 year mark. Obviously that’s not a fixed timeline – and acidity/sweetness can vary this considerably – but it holds fast for many typical dry Australian Riesling. I find this a trait highly specific to the Clare, somewhat in the Eden Valley, with lesser of an instance virtually anywhere else, even including Great Southern. Not to disregard stages where primary softens and secondary hasn’t yet kicked in, which may present a little similarly but nothing like the full extent of “adolescence” or a “flat spot” we refer to. This flat spot is most certainly not ‘nor has it ever been a nationwide assumption. If I did see it in a Riesling from the Victorian high country, I’d quite rightly be highly surprised. I’d agree it’s typically a Clare/Eden character too Tony, though I’ve seen very similar flat spots in dry wines from all over the country – Grampians and Canberra for starters (and I disagree that Great Southern isn’t prone). You know what the challenge is? We have so little genuine high country/seriously cool climate Riesling as a counterpoint to be broadly benchmarking against. Sure, there is more wine than ever from Tassie, Henty or indeed NE Victoria, but the bulk of our Riesling production is still focused on locations that barely scrape in as ‘cool’ – like the Clare Valley. Andrew, are you able to recommend a few seriously cool climate Rieslings ? Crawford Riesling is the natural pick, or Lark Hill, David Lowe’s Nullo Mountain wines are super cool climate (but I’m yet to taste one that nails the balance). The Pressing Matters Riesling from Tassie is genuinely cool climate (and they can be delicious). Of course you could Mosel Rieslings for a benchmark (I can never drink enough Dönnhoff) just for fun too. Your comment about wineries being more valued than vineyards is interesting but I can’t help but wonder if that’s down to the wine media itself ? There are plenty of articles & interviews in wine mags with winemakers, some of whom do indeed seem to think they’re rock stars, but I don’t recall ever seeing a profile on a vineyard and the person behind it. I think such a piece would be fascinating – why did they plant grapes in the first place, why did they pick the specific grapes for that site, how does the terroir affect the development & flavours of those grapes etc. Agreed. There’s a story there for sure. There are some really interesting growers out there who grow rockstar fruit for a start. Like Ken Bray in the Hunter (source of the Thomas Braemore Semillon, Meerea Park Alexander Munro Semillon etc) or Adrian Hoffman (source for all sorts of top Barossa Shiraz). Deserve more attention. I’m loving the introduction of a Viticulture Trophy at a number of shows, specifically recognising a single vineyard wine’s grower. I’ve often bought a wine at least partially because I know from whom the fruit was sourced. To have more famous vineyards would be fantastic, but I think it is more about vineyard than viticulturalist when it comes to promotion to consumers. Much like, despite what we in the industry think about the proliferation of winemaker articles, most engaged consumers know great winemakers from the producer name, not the winemaker’s name.